BANGI, 7 Sept 2012 – A sociology professor at The National University of Malaysia (UKM) and a self-confessed enthusiastic photographer and printer uses his passion for images to enhance his academic duties as a sociologist, anthropologist and historian. Prof Dr Kamaruddin Mohd Said who specialises in the sociology of industrial relations at the Faculty of Social Sciences and Humanities is a firm believer in industrial harmony and building bridges especially with neighbouring Indonesia. National Council of Professors recently appointed him to head the History, Heritage and Socio-cultural Cluster taking over from Prof Dato’ Zainal Kling of Universiti Perguruan Sultan Idris (UPSI). Prof Kamaruddin is also a member of UKM Senate, and head of UKM Press. In this capacity, he has won plaudits for a recent publication about the biography of Malaysia’s second Prime Minister Tun Abdul Razak. Penerbit UKM won the National Book Award for the Best Biography category earlier this year. The award for the biography of ‘Tun Abdul Razak: Statesman and Patriot’ is a recognition of excellence from the National Book Development Foundation and The Oxford Centre for Excellence, UK for 2012. Asked about current developments in the field of sociology, he said Malaysian society has developed a lot since independence. A lot of water had passed under the bridge since then but those in power had not noticed the changes. There has been a shift in mindset of Malaysians over the course of fifty years. Where once nationalism, combined with other factors, could be invoked by politicians among certain sections of the population, today that is no longer the case, he said. Government should understand the mindset of the people and not merely assuming that their wants and needs today are the same as their parents’ fifty years ago. Nationalism has been replaced by justice, that is natural justice, as the priority among the younger, better-educated set. Prof Kamaruddin said Malaysians now have a colour-blind mindset, at least among the younger generation. The basic principle is understanding and basic justice; the justice that people can feel. That is what the present generation want. He explained that the phenomena is not only confined to Malaysia but happened all over the developing world and even in the supposedly more advanced United States. Not too long ago it was inconceivable for an African-American to be elected President. Even ten years ago no one could have imagined it was possible. But in the last Presidential Elections 43% of white voters chose barrack Obama. The conclusions are clear enough, he said. Prof Kamaruddin believes that today the mindset is no longer determined by culture alone as a collective mindset. People today are not overtly influenced by customs and traditions from within an ethnic group. Instead, the biggest influence is conscience. People now think of whether something is “ right” or “wrong” for society as a whole in the sense of natural justice. It is no longer the case of ethnicity over basic rights. 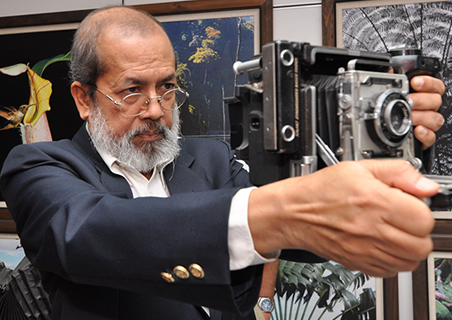 His research on society also ties in with his serious enthusiasm for photography. 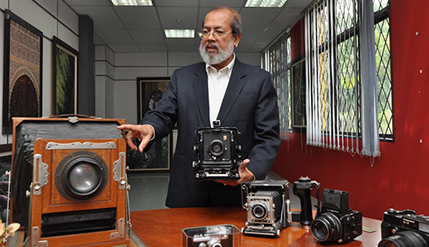 Prof Kamaruddin’s works have been exhibited at home and abroad, as well as having sold some of his photographs as works of art. 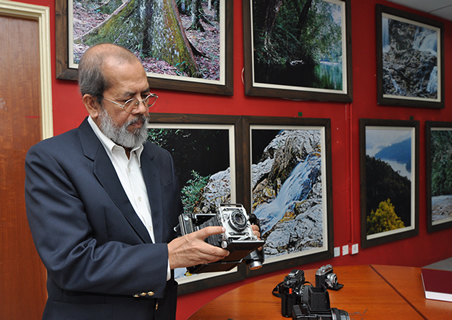 Hundreds of his pictures have already been sold at about RM900 each to local customers and expatriates. He bears all the expenses of his hobby and the sales help to defray the costs of printing, enlargement and framing of the pictures. The corridors of Penerbit UKM are adorned with some of his photographic exhibits; mostly natural landscapes and architecture. Prof Kamaruddin obtained his PhD in anthropology from the University of California, Berkeley. His research interest covers diverse topics: conflict, mediation and arbitration in industrial relations in Malaysia, the fishing economy from an anthropological perspective, the sociology of (Malay) literature, and the culture of aboriginal communities in Peninsular Malaysia. He has published numerous books and journal articles on industrial relations and the fishing economy as well as on the transformation of cultures of aboriginal communities in Malaysia. He has also served as an editorial advisor for Sociology, a journal published by the British Sociological Association. One of the highlights of his carrier was his appointment as a visiting scholar at Tsukuba University, Japan. Prof Kamaruddin’s lecturing career began in 1980 at UKM. In 1990 he was promoted to Associate Professor. He did a stint as a lecturer in Japan where he was appointed Foreign Professor at University of Tsukuba from 1994-1995. After his return home, he was appointed Director for the Centre for Educational Technology, UKM, 1996-1998. In 2001 he became Head of the Anthropology and Sociology programme and subsequently made professor in 2005. Prof Kamaruddin’s penchant for better understanding of communities and societies extends to the country’s neighbours, particularly Indonesia. He is the chairman of Pemikiran Nusantara, made up of academics of both nations. He said they strive to improve bilateral ties by discussing their common Malay heritage. He described the job as a huge challenge, considering the recent spats between the two countries over cultural identities. He thinks it will be safer for academics to argue over the various issues of cultural heritage, rather than let the politicians fight it out. Academics and scholars, he added, would be able to understand each other better.